Starcore’s management team is committed to driving and developing our companies towards our growth and valuation objectives while maintaining an unwavering commitment to social and environmental stewardship. At Starcore, we believe that combining a strong mineral production and exploration model with robust corporate social responsibility mandate provides significant investment certainty to our shareholders through the application of sound business and human ethics. Starcore is committed to upholding this corporate ethos as a hallmark of our company. "I would like to congratulate our diverse team of talented employees around the world." We support our community’s kindergarten and elementary school and donate generously to their programs. We built a roof covering the elementary school’s bleachers and continue to maintain the school grounds and entrances. We fund the annual summer camp for the community’s children, 90% of whom are part of our miners’ families. And for our employees at San Martin mine, we provide annual medical check-ups free of charge, including prostrate antigens exams, audiometry exams, physical exams, glucose, triglycerides and cholesterol exams, and thorax x-rays. Our community’s children planted 90 trees on World Earth Day 2013, revitalizing the northern part of the tailing dam’s reforestation program. We provide a nursery for plants in the region, reproducing an estimated 10,000 plants per year. Our reforestation plan provides for an estimated 7,500 plants to be planted every year from May to July. Our dry stack tailings process means we recycle more of our process solutions within the plant. The process effectively reduces our water consumption and eliminates the risk of discharging harmful solutions to the environment. We revegetate our land area with greater efficiency and ease. In December 2016, an agreement was announced between Starcore International and the community of San Martin to turn unused land of the community into a park and recreational area. The community based design approach relied on the dynamic relationship that exists between the San Martin community and the San Martin mine. Through friendly engagement of the community, the children from the primary and secondary school were able to submit ideas and plans based on the perceived needs of the community. The ideas were submitted to a panel that consisted of mine staff and community members, and the best idea that focused on sustainable and an equitable solution to the unused land was chosen. The plans submitted reflected an incredible amount passion and vision, clearly demonstrating that the desire to create a park for the generations was natural to the children. The inauguration of the park included mine staff, community members and the children, and political ambassadors to Mexico from Canada. The participation by various parties echoed the harmony that is created when community and company work together, and the power of investing in social goods. Covenant House Vancouver (CHV) serves over 1400 at-risk and homeless street youth annually by offering a continuum of care including a drop-in centre, crisis shelter, and a transitional housing program. Through these CHV facilities, Vancouver’s homeless and wayward youth are able to access the support, guidance and tools necessary to successfully transition from life on the streets. Corporately, Starcore has partnered with Covenant House Vancouver through sponsorships and the hosting of charity wine tasting events, “Making Change, One Ounce at a Time”, in an effort to ensure their invaluable humanitarian contribution to our community is maintained. Starcore is very proud to continue its partnership with this important local charity. Starcore successfully hosted our second Charity Wine Tasting Event on June 4th, 2012. We are extremely pleased to announce that $38,500 was raised in support of Covenant House Vancouver through generous corporate sponsorships, a ticket sell out, and a superb raffle! For more information about Starcore’s 2014 Charity Wine Tasting, please visit our group of companies, iMining and click here for more details. Thorn Yar and her family have hope they never had before for a different future. Thorn Yar, 23, and her husband Yaw Laus, 26, are just beginning their life together and are starting their own family. They live with Yar’s parents in Kseit Borey. Her parents moved here in 2006 when they learned they could receive land and had hope to build a different life. Since Yar has lived in Kseit Borey, she and her family have struggled to survive. They had land, but they were poor, and so they could not clear and plough the land while they were trying to feed themselves. Laus & Yar’s father often worked in the jungle cutting wood in exchange for small amounts of cash and rice or to sell in the local market as firewood. This is dangerous and difficult work, and they would often be gone for 2-3 weeks at a time. The rest of the family searched for food and water; sometimes Yar would also have to work as a day labourer making as little as $1.25 a day. Using the small amount of land that they were able to clear and plough, they grew rice, but it was never enough to eat and sell in order to make progress; in this way the family was trapped in a cycle of poverty. Now life is very different for Yar and her family! Since receiving access to clean water and their water buffalo, they have been able to make big changes. With the help of their buffalo, they have cleared & ploughed a large area of land and the family now grows lots a of rice and has a garden as well, where they grow cassava, corn, and other vegetables all year-round. 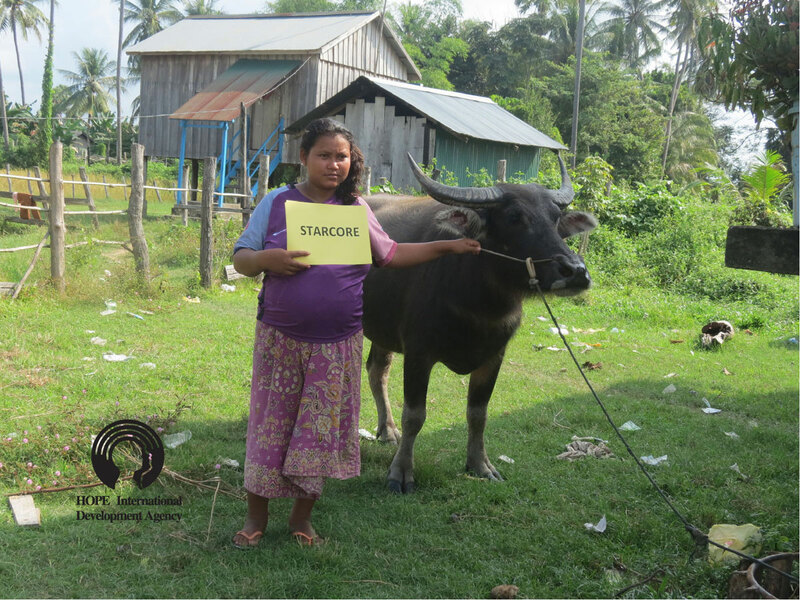 The water buffalo also produces manure and the family received training on how to best use it to make their crops flourish. They now have enough food to eat and to sell. Today Yar & Laus’ baby is going to come into a world of opportunities that Yar & Laus never had. The family plans to keep expanding their garden and grow peanuts and mung beans. Yar is saving for a motorbike which will allow her to go further to sell their crops for more. Yar has long dreamt of building a new house for her own family, but now that dream is possible. The future is bright for Yar & her family!